Gold, silver, bronze, copper, pewter and platinum melt into a noble metallic mix fit for a King with the theme Precious Metals. 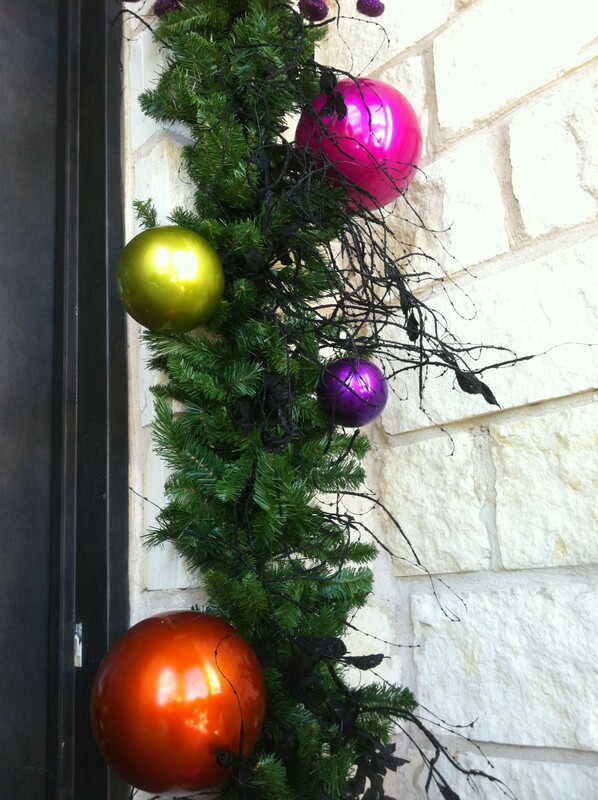 Add sparkle to your tree with luminous shades of metallic finishes. The shimmering gold and silver floral, brushed matte pewter balls, melded with antique copper and rustic bronze finials offers an added dimension of elegance. Following fashion trends, metallic is in! 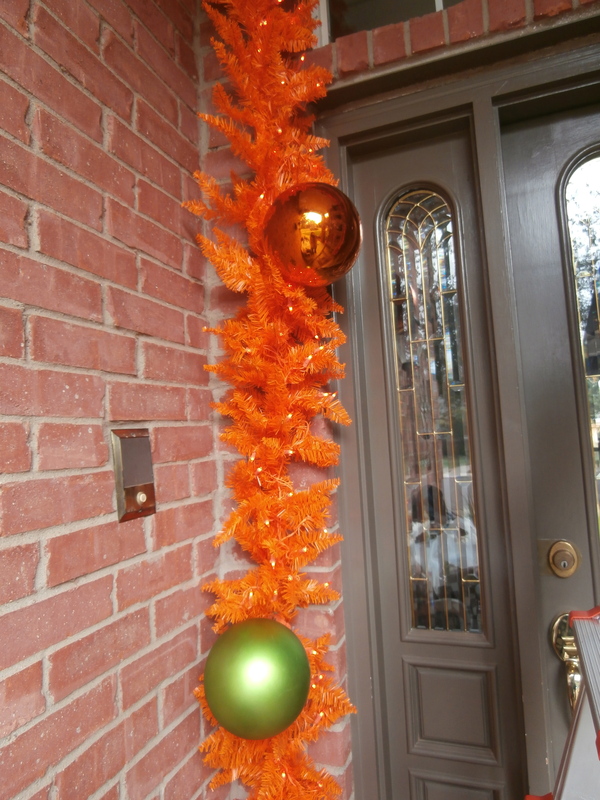 Show Me Decorating, Shows you “how to” create this Holiday trend on your Christmas Tree to celebrate the season. 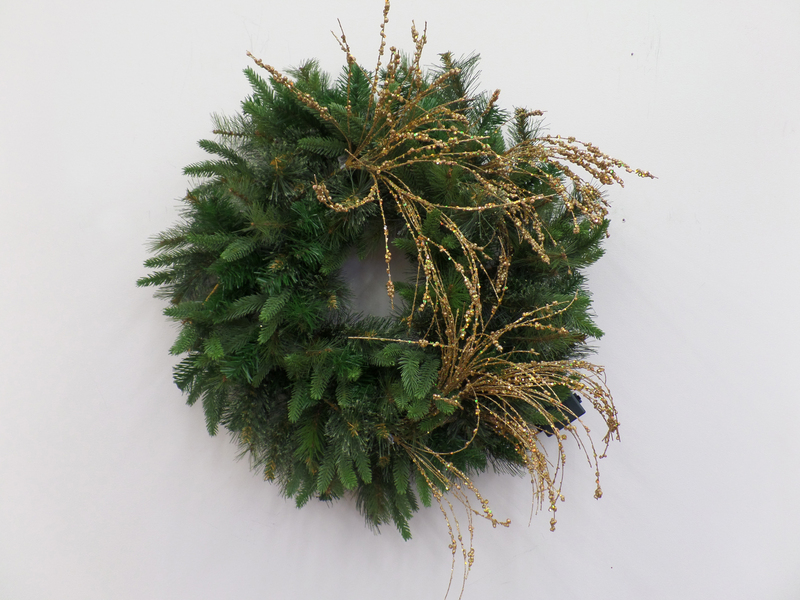 What is the largest decoration at Christmas? 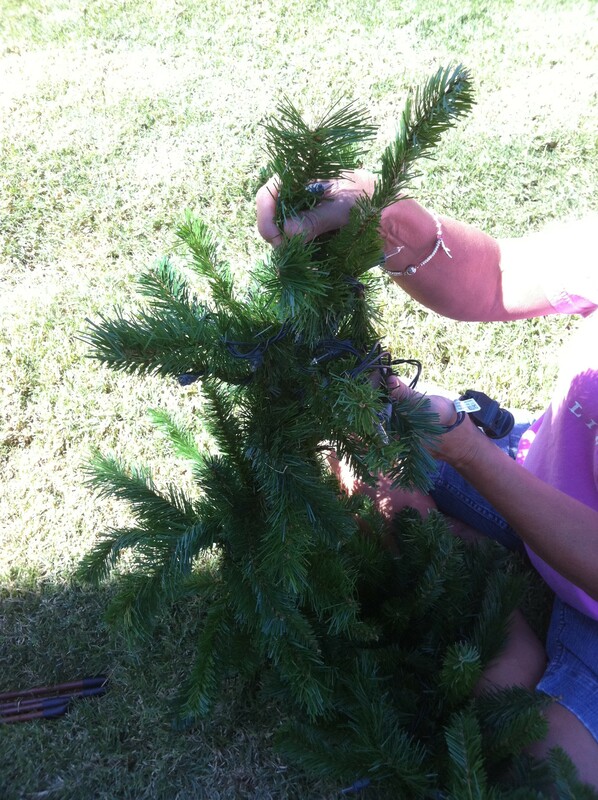 The Christmas Tree! 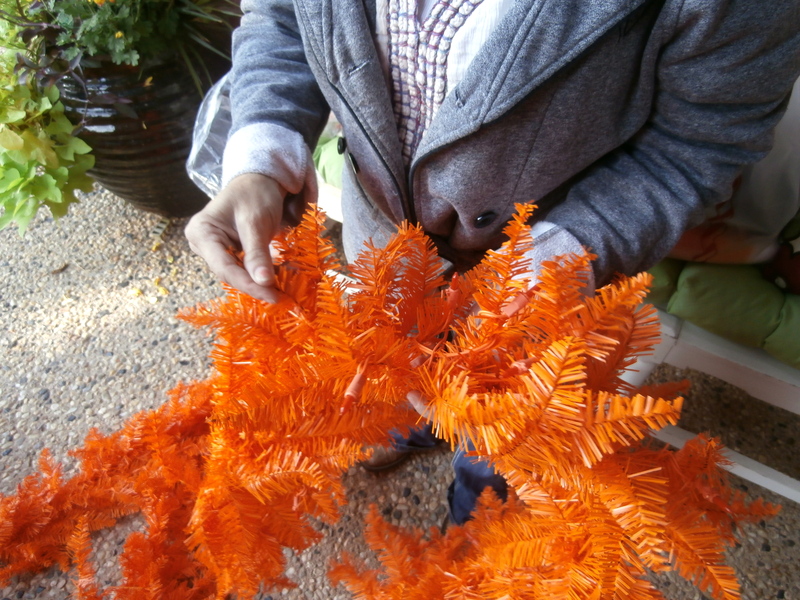 To take the guesswork out of decorating and give your holidays the look of a designer, pick a theme or color story for your tree. 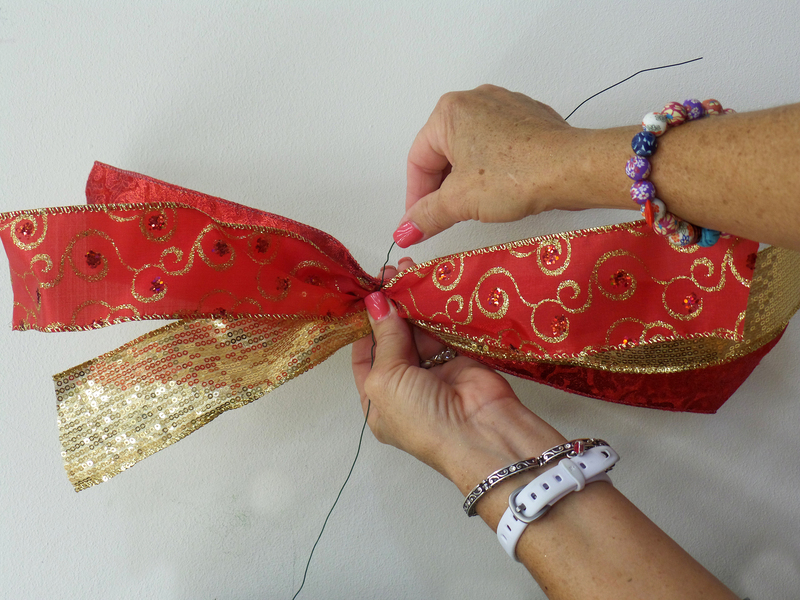 Using 4 ribbons make half bows of each ribbon making each a little larger ending with the Animal print, hold together with a florist wire. 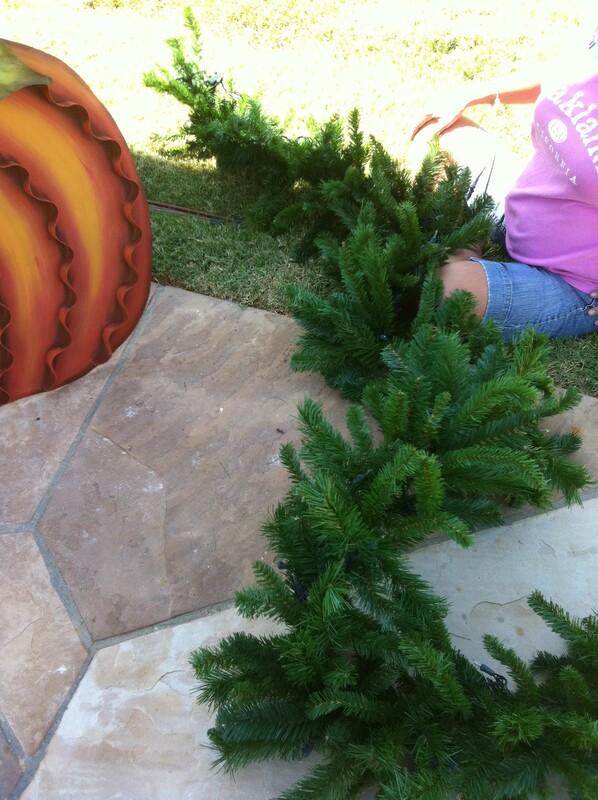 Attach a brown glitter poinsettia to the middle for a special touch. The mix of gold, silver and platinum glitter support the metallic theme, and the leopard ribbon adds an air of sophistication. 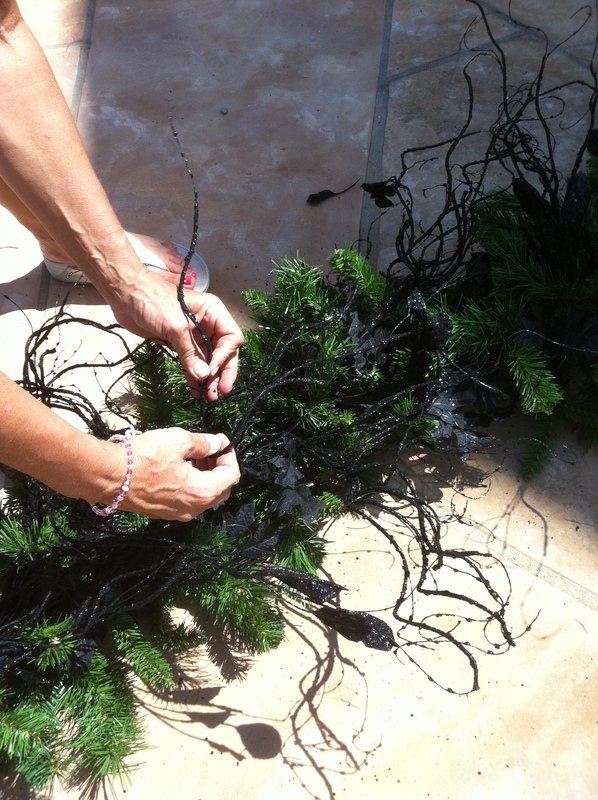 Ribbon the 1st key ingredient for a Show Me Decorating Christmas Tree Theme! 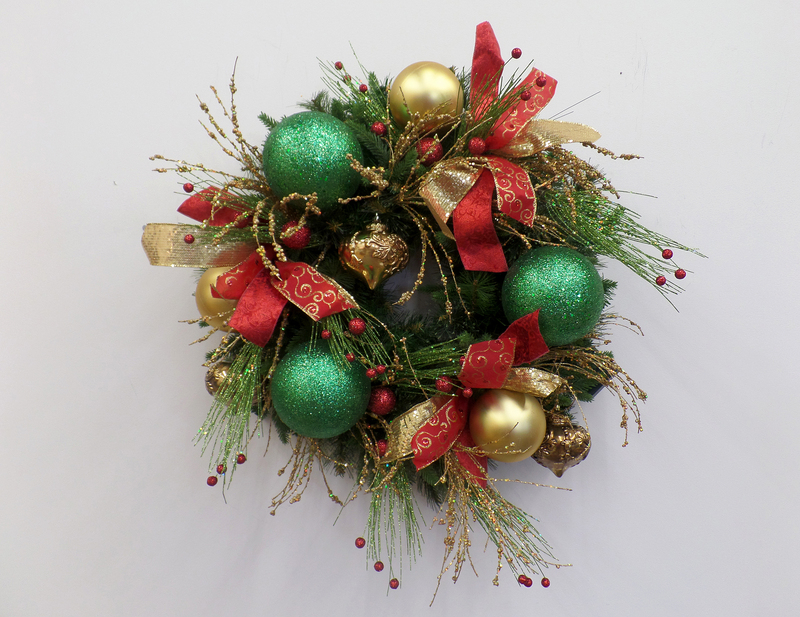 Gather up all your Precious Metal Christmas decorations, add the 3 key ingredients from Show Me Decorating, ribbon, balls and floral and “Melt” your Christmas tree into the trendiest look for the Holiday season! 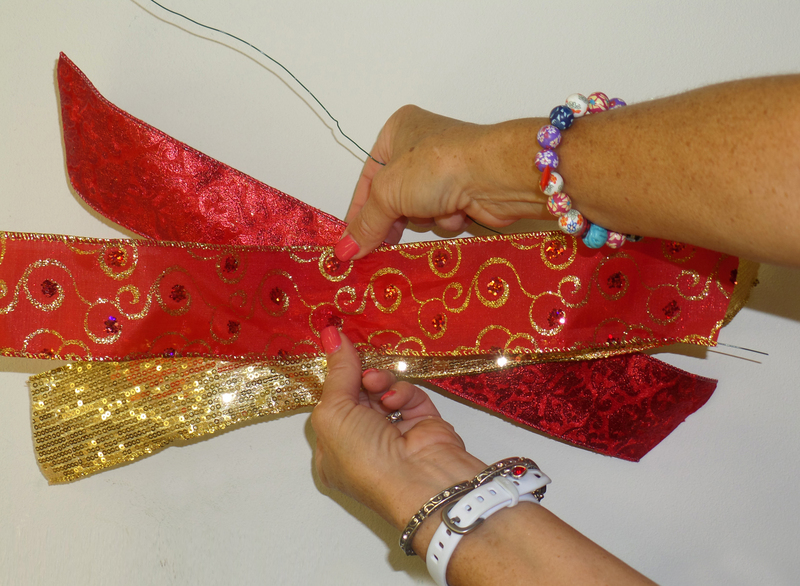 Layer ribbon strips red, gold and patterened red/gold swirl on top. 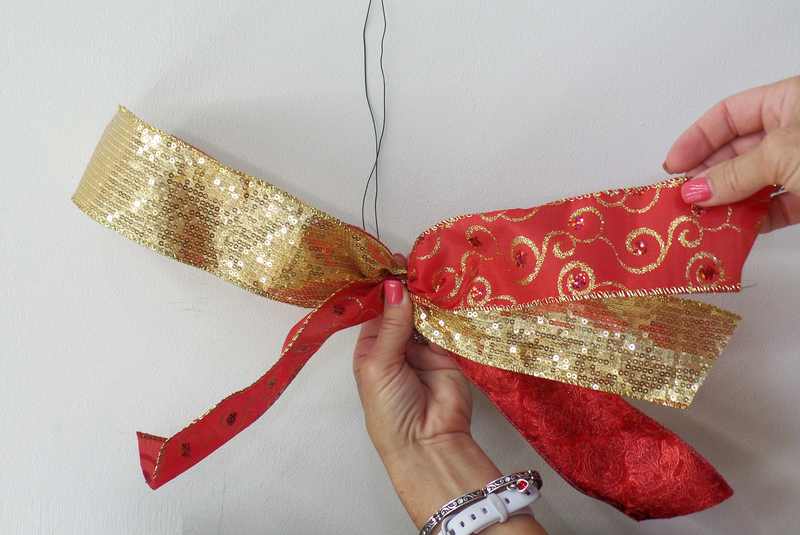 Pinch ribbons in the middle and using a florist wire wrap and twist on the back. 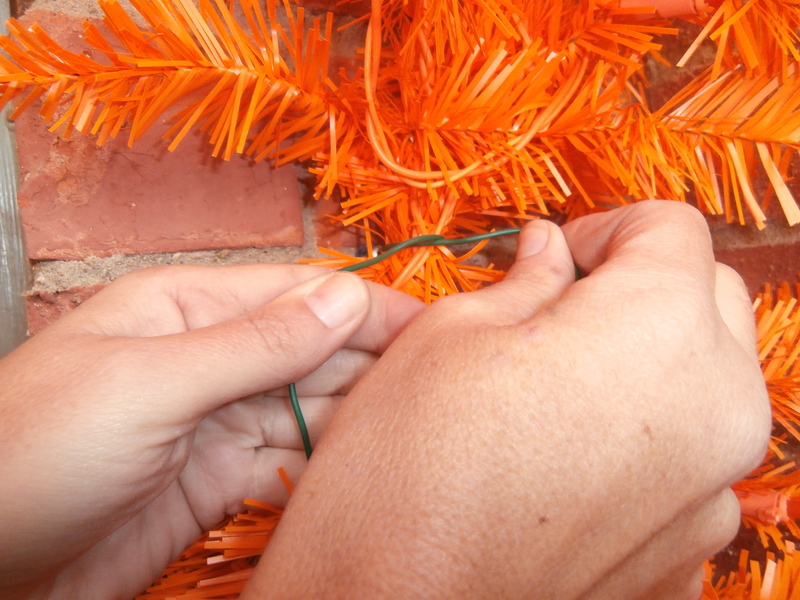 Florist wire is used to hold the ribbon tie together, and add to the wreath. 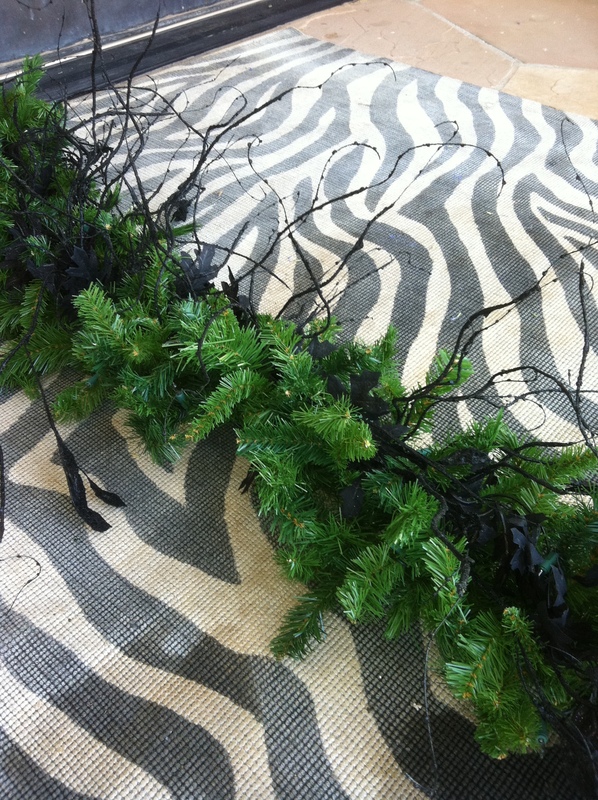 Add in a glitter gold floral spray, using it’s wire base and the pine branches to wrap and secure. 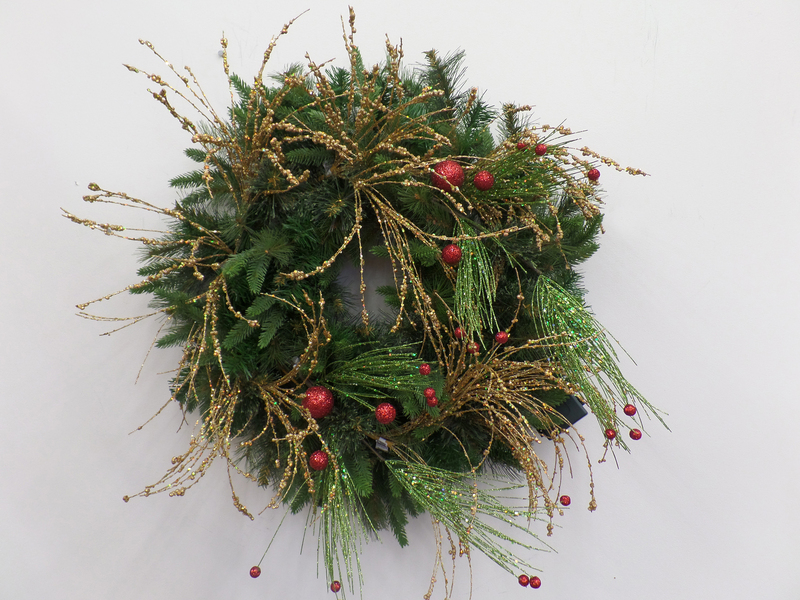 Next layer is a green glitter spray with red glitter balls, shape and add to wreath. 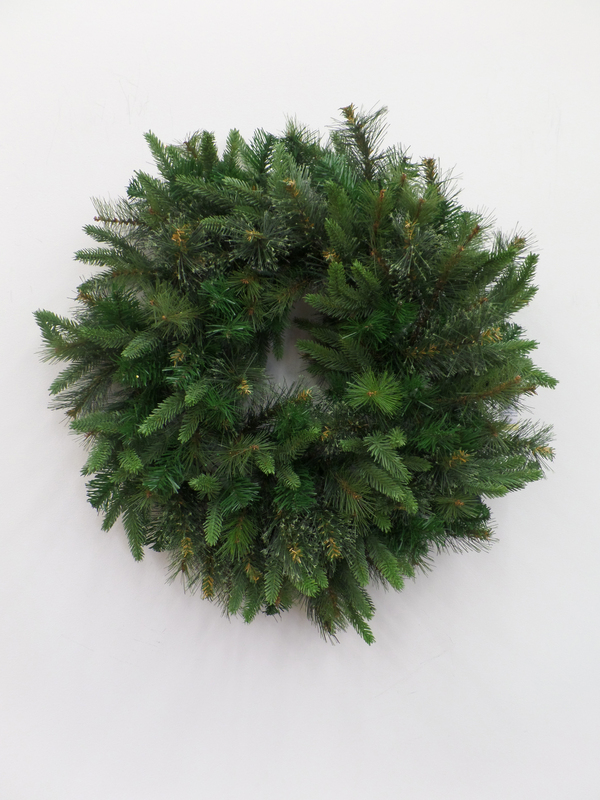 3 green glitter sprays with red glitter balls were layered and wired onto the Faux green pine wreath base. 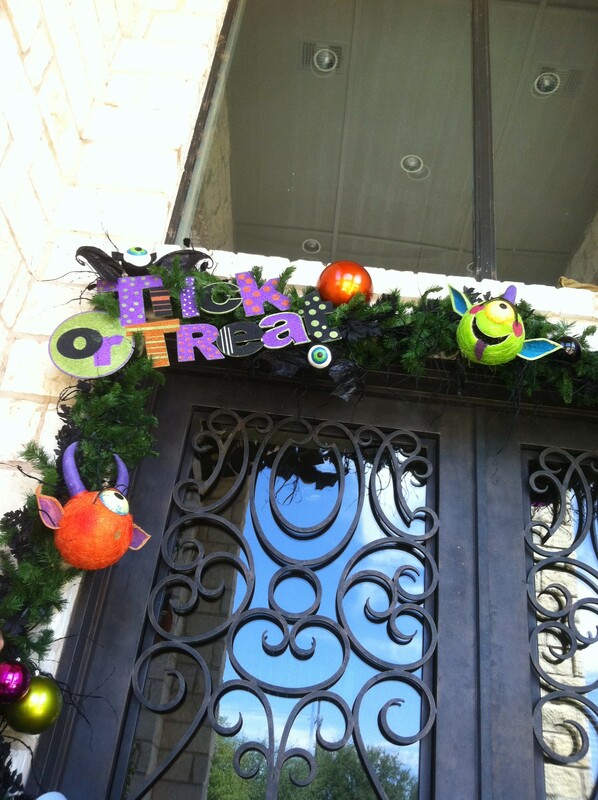 3 Ribbon pig tail bows were wired onto the wreath in a triangle pattern. 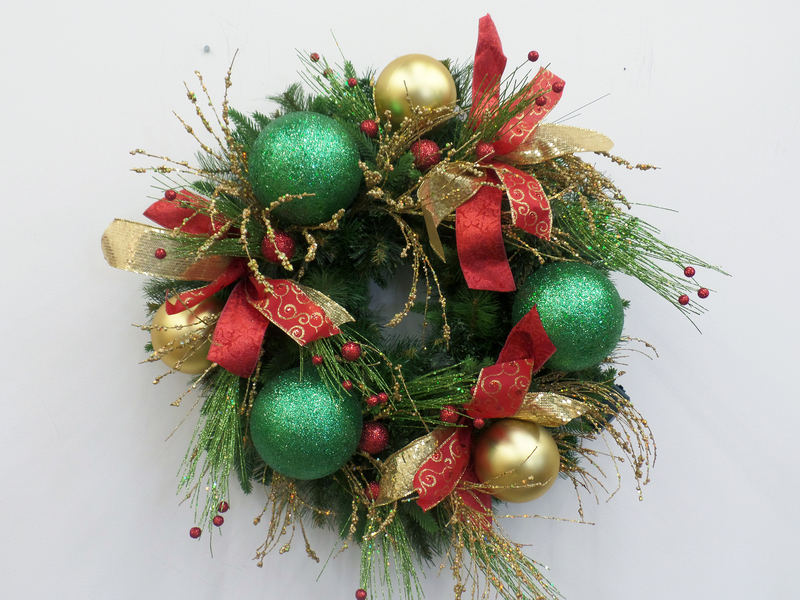 Balls are added in 4″matt gold and 6″glittered green, 3 each placed inbetween the pigtail bows, in a triangle pattern. 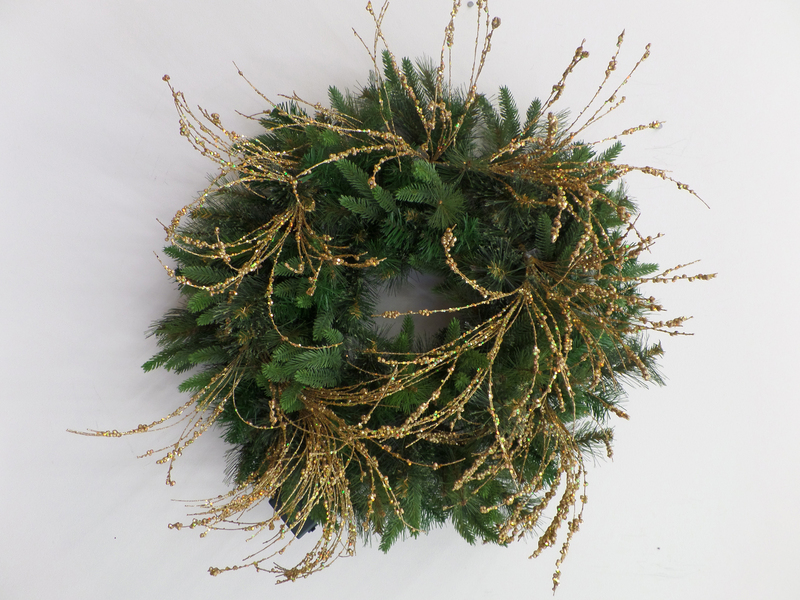 Your custom (made by you) wreath is almost complete! 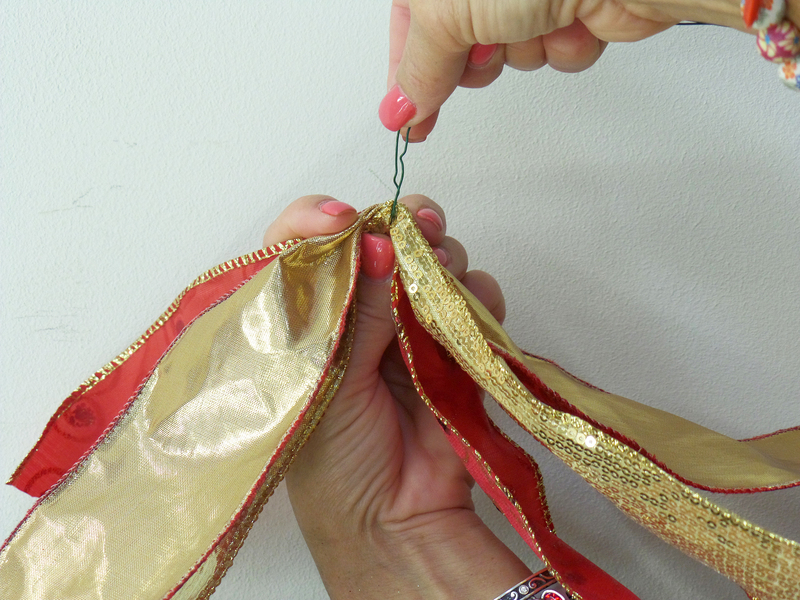 Add in gold filigree ornaments to dress up for the finishing touch! 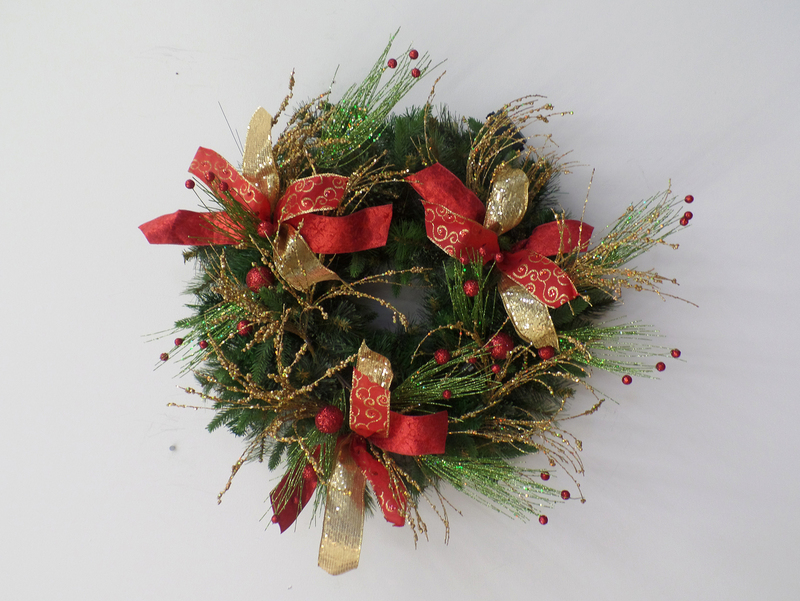 The Christmas red, green and gold wreath is beautiful and will be a welcoming holiday touch for your front door! 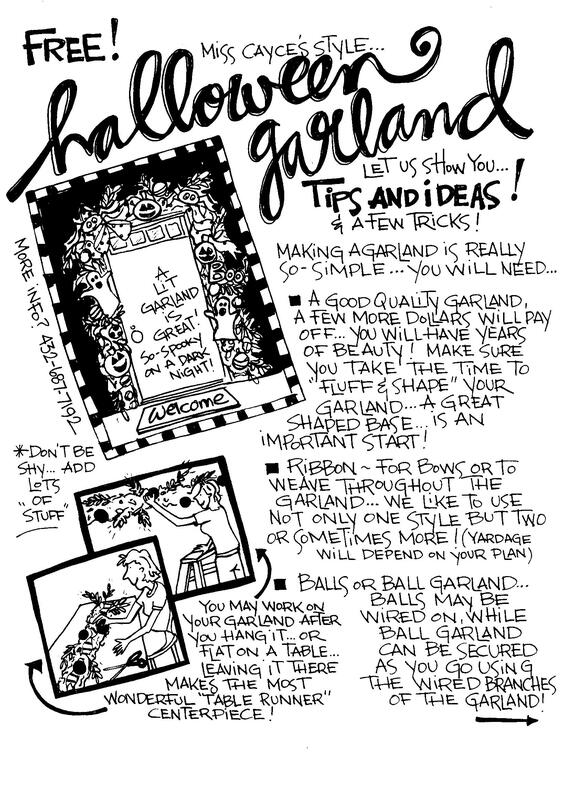 Use it over the fireplace mantle combined with a complimentary garland. 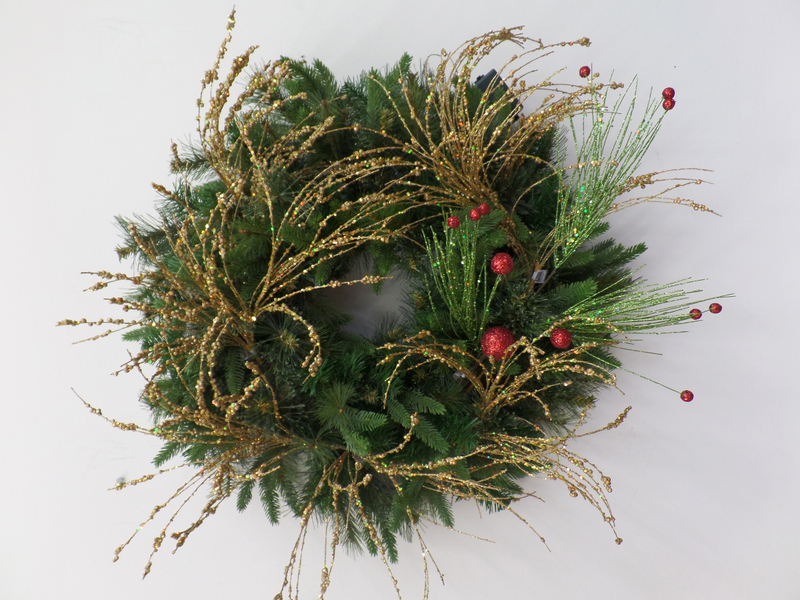 It just takes 3 key ingredients to decorate for the holidays……. 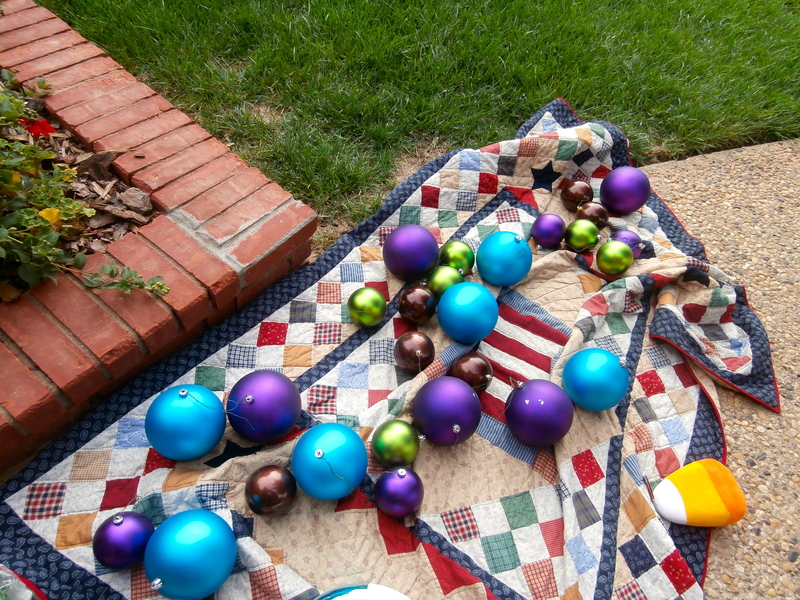 ribbon, balls and florals. 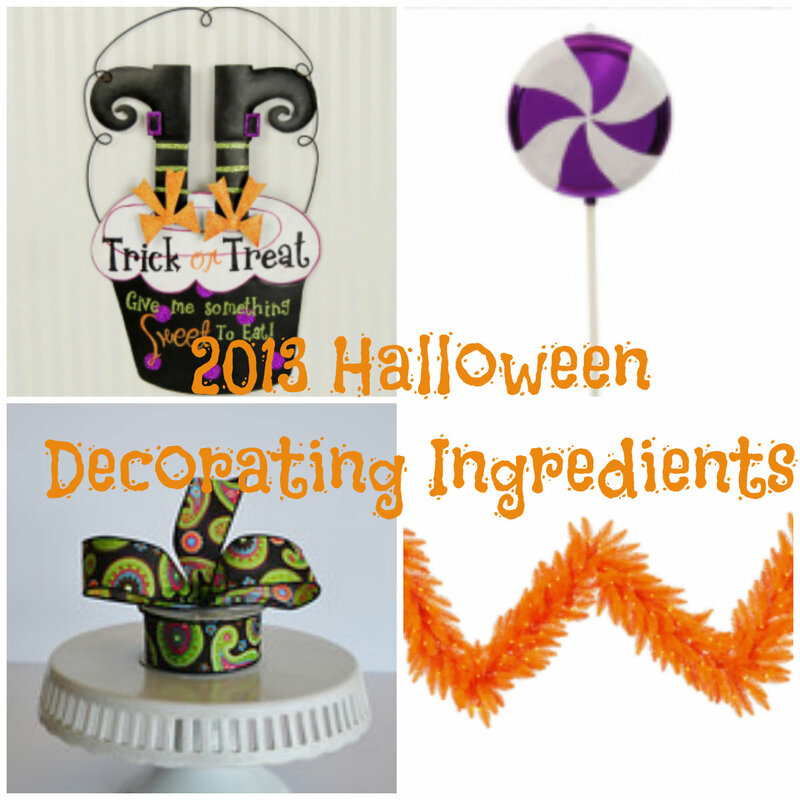 Choose your theme or color story, purchase quality ingredients to use year after year, and enjoy decorating with confidence. 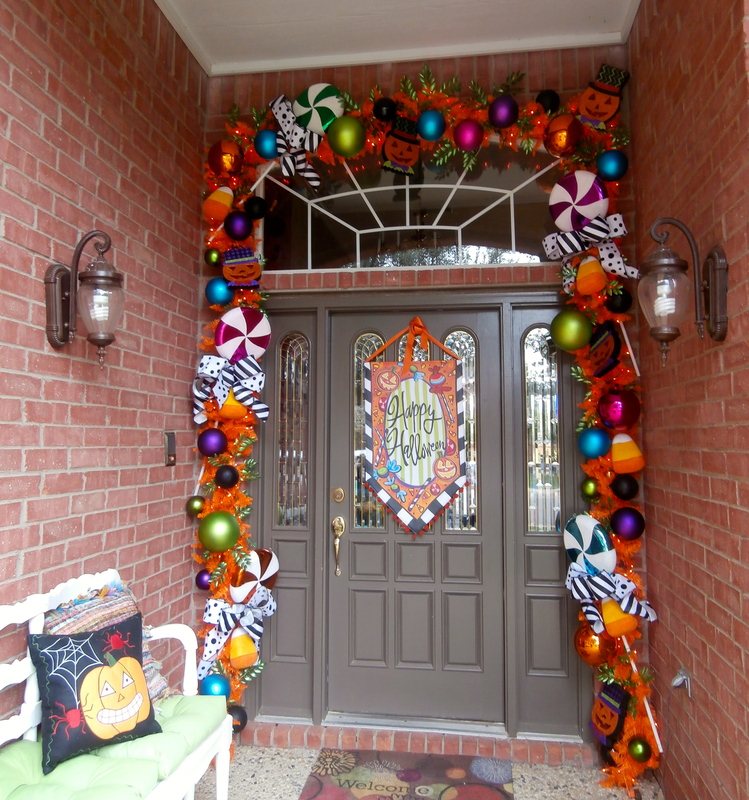 The Lisa Frost Halloween banner was the inspiration for this fun and colorful Halloween doorway! Show Me Decorating tip: Picking a theme (from an inspiration piece or item) or color story will help narrow selections for your decorating projects. 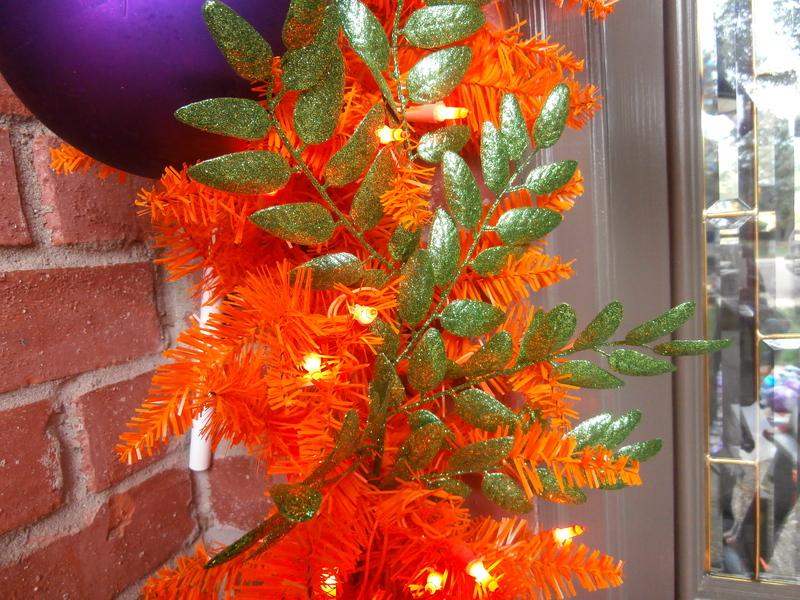 Glowing orange Faux garlands will be the base for this Fun Candy Halloween garland! 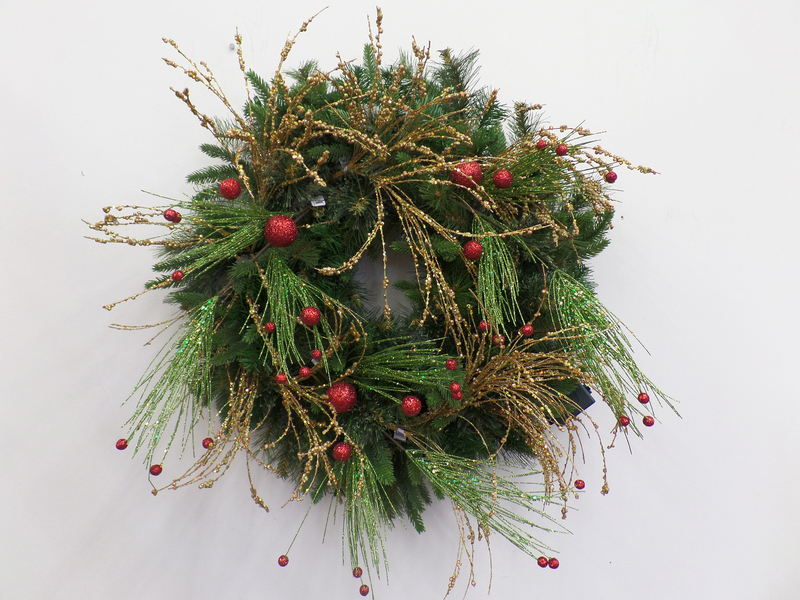 Designer tip: always shape faux greenery and florals, handle each branch, pulling out and shaping for a full look. 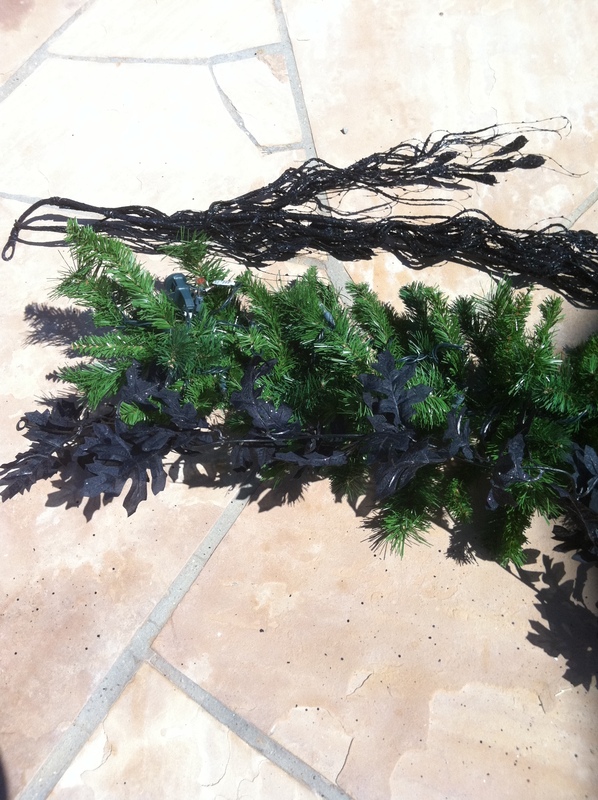 Quality wired garland is a must to attach and wire your focal and filler items, ribbon, balls, florals etc. 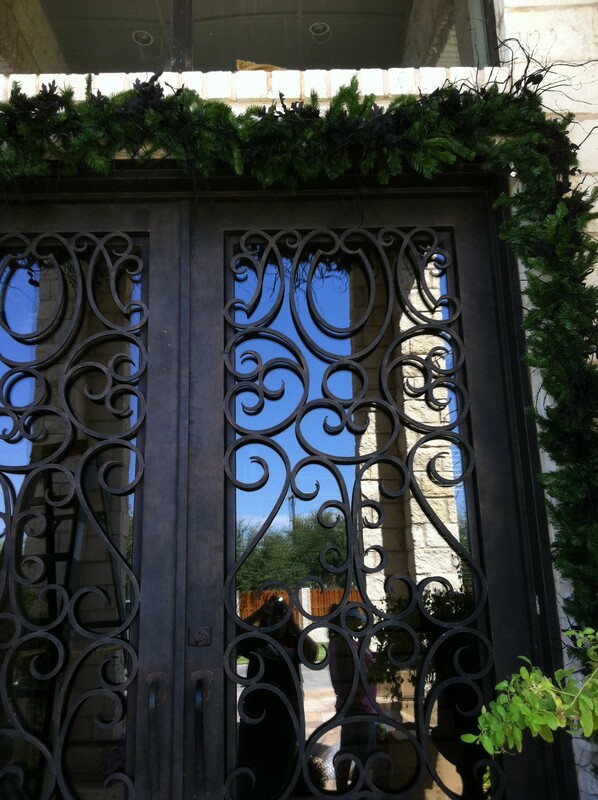 Permanent screws have been installed in mortar around the doorway. 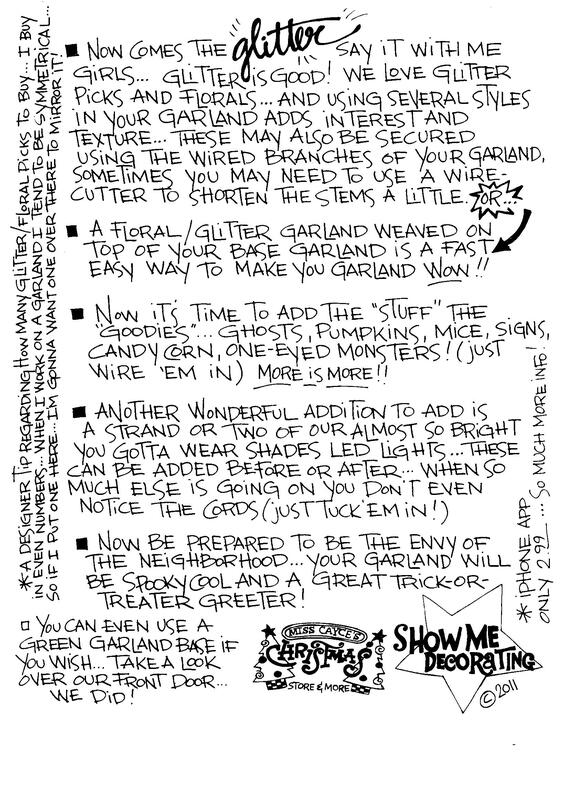 Landscape wiring is attached and then garland is wired on by twisting the wire over and back. 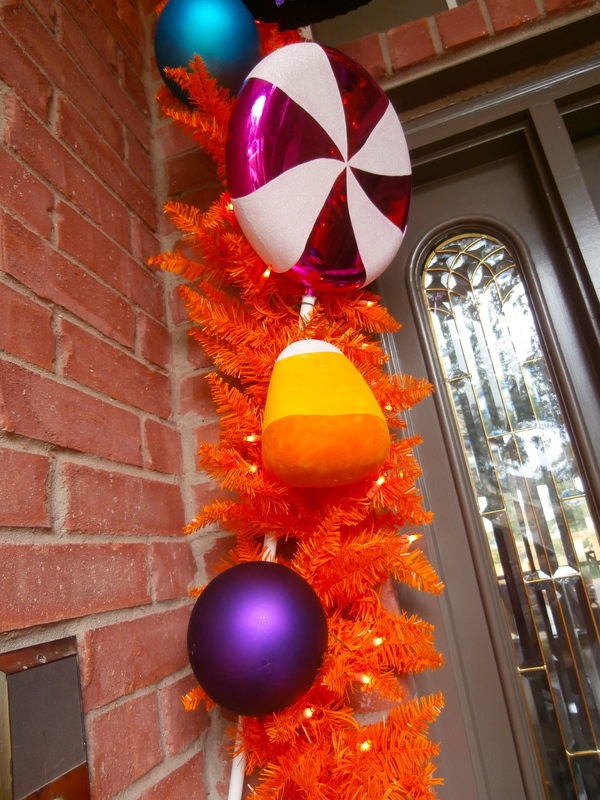 8″ Shatterproof balls are wired on 1st, colors coordinate with the inspiration banner. Matt and shiny finish are selected for interest. 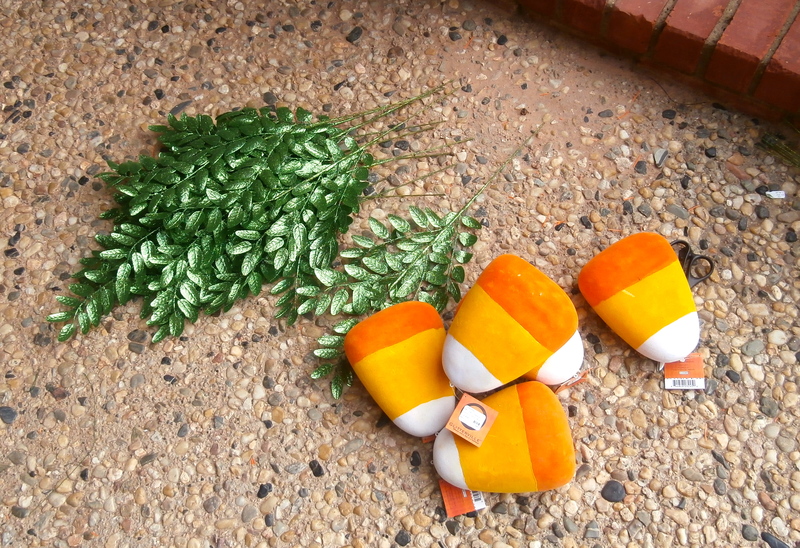 Supplies are gathered on a blanket to protect them from the ground. Oversized candy corn and glitter florals will help complete the look. Always think in size and proportion to your doorway, and what can be seen from the street. 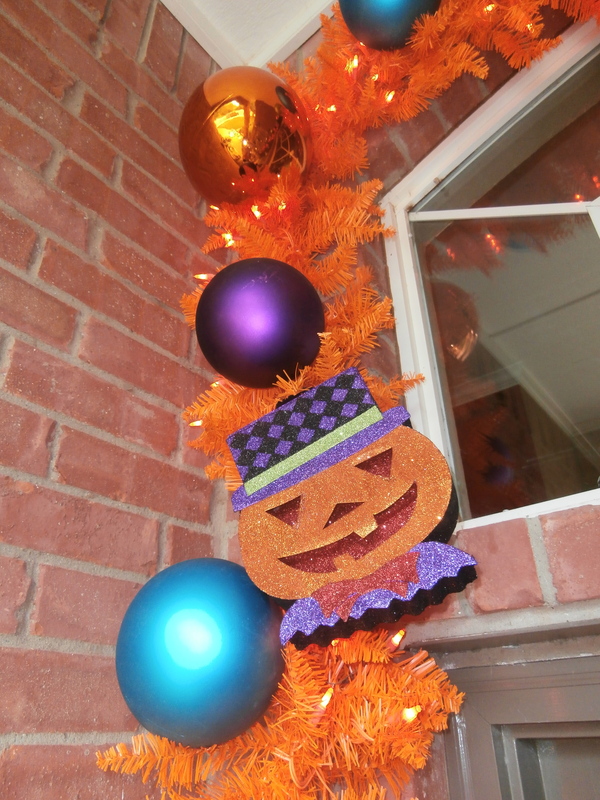 Glitter Jack o Lantern faces are light weight and add in after balls are attached. Glitter florals add fun and color! 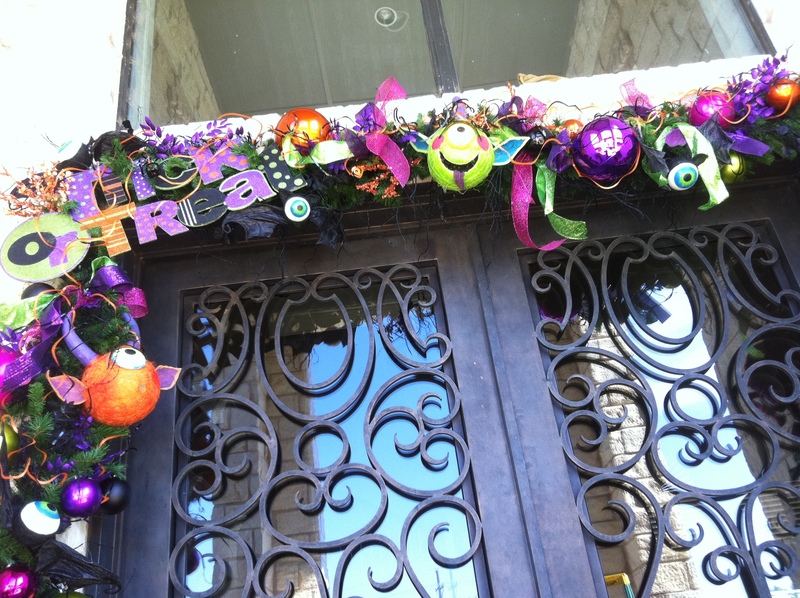 Lime green coordinates with inspiration Lisa Frost banner! 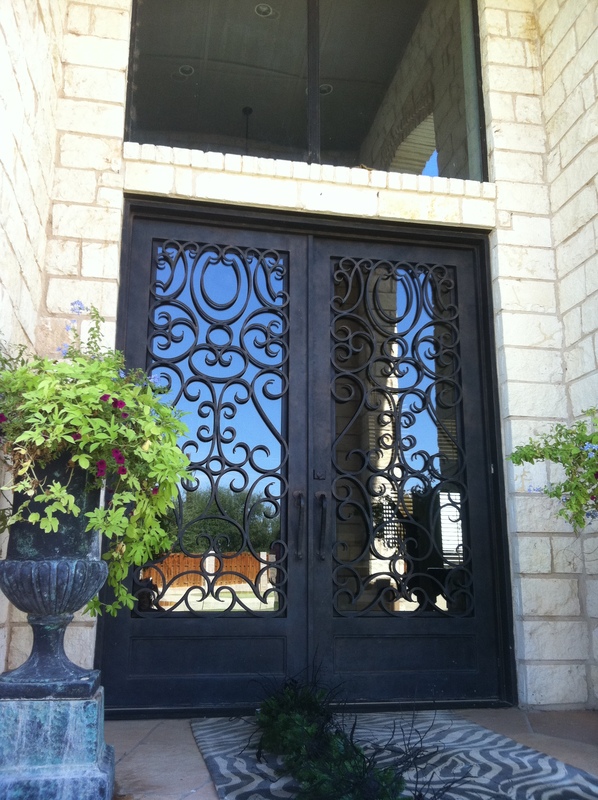 A good Quality base is a must to allow you to wire and secure big focal points to. 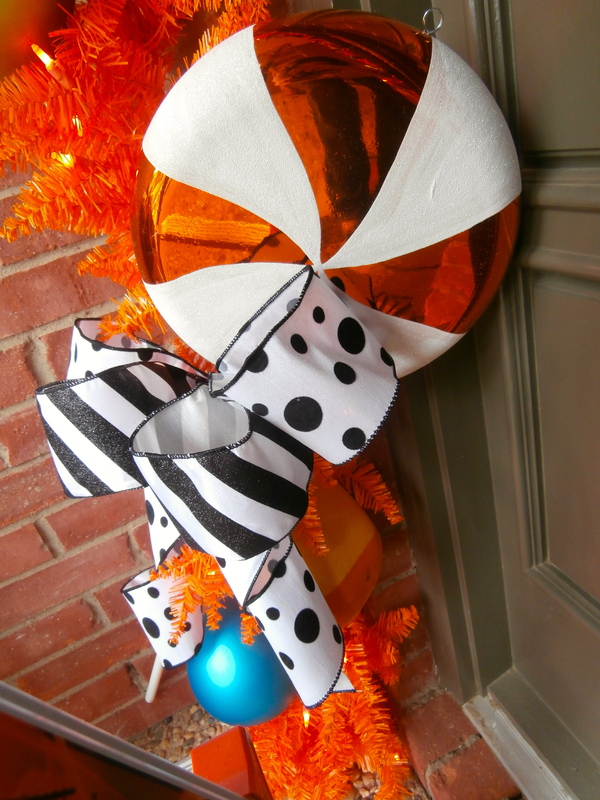 Black and White ribbon in stripes and polka dots will add a punch to this bright orange garland! 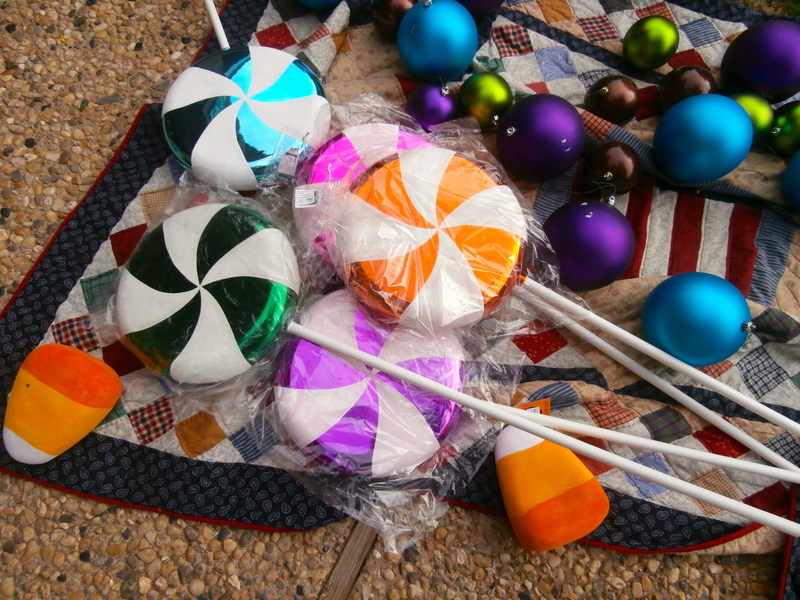 Giant lollipops and Candy corn, match the inspiration #Lisa Frost #Halloween banner. 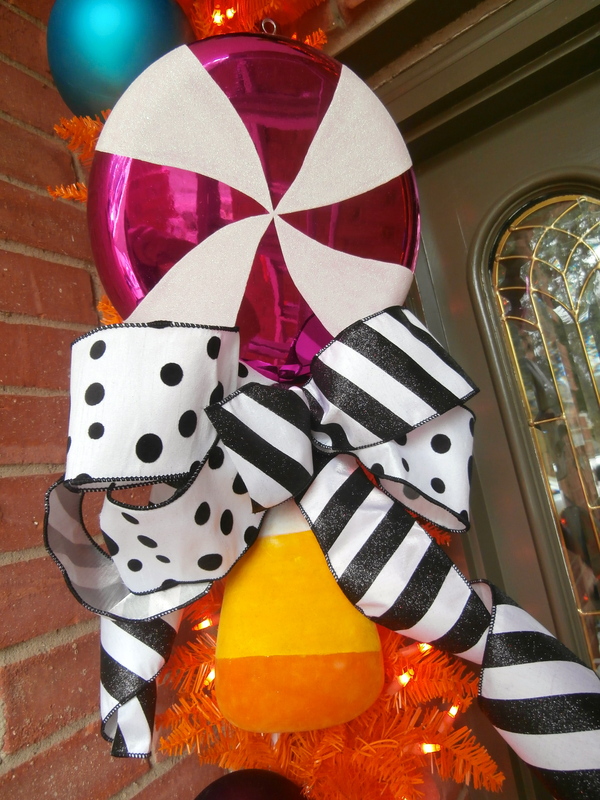 To update your Halloween, add Black and white, polka dots and stripes with wired ribbon. 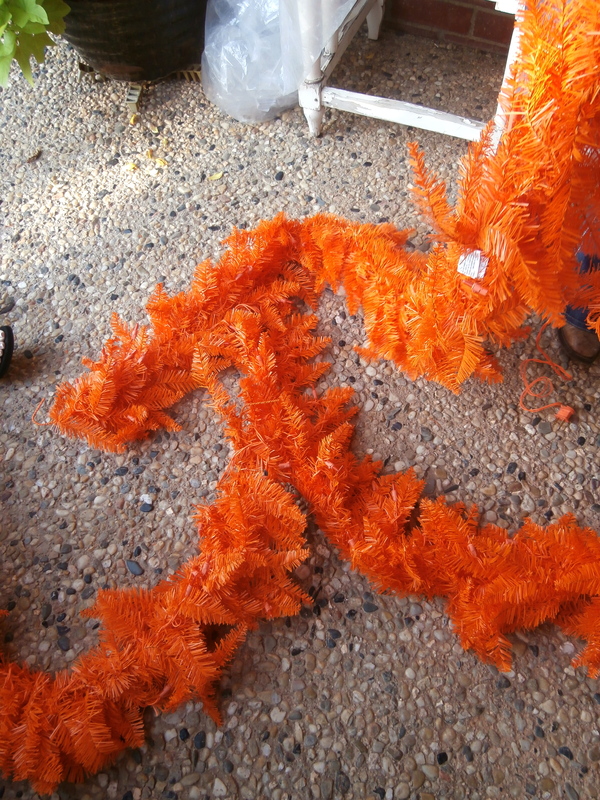 the wider the ribbon the less it takes to make an impact. 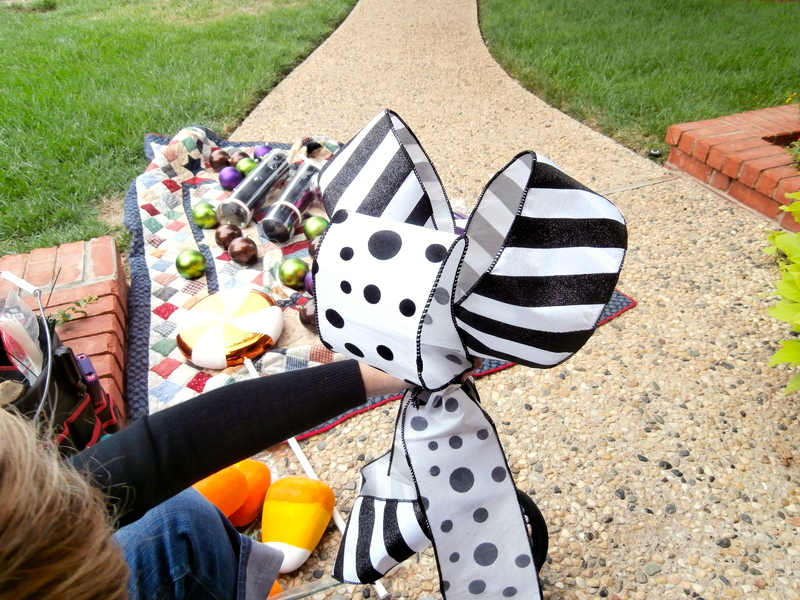 Loops and tails make for a fun bow treatment. 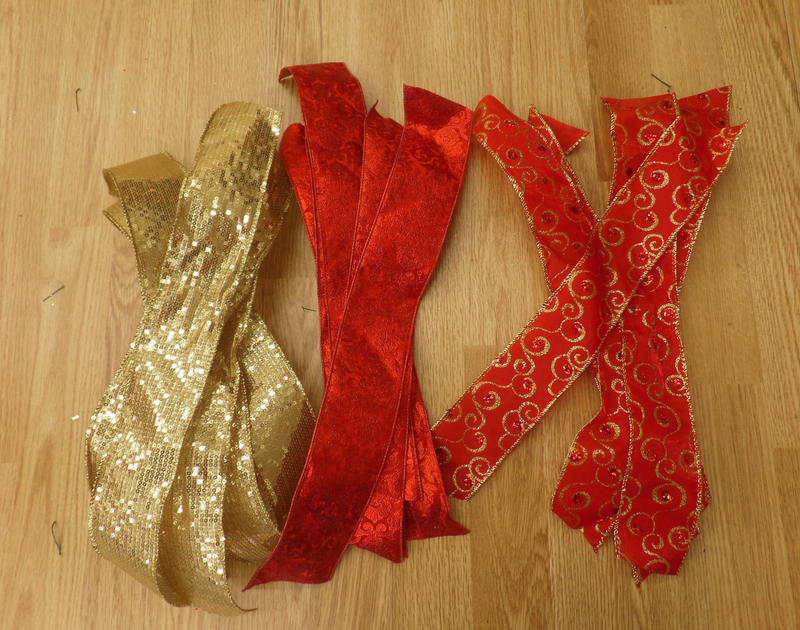 Good quality ribbon will last several years. 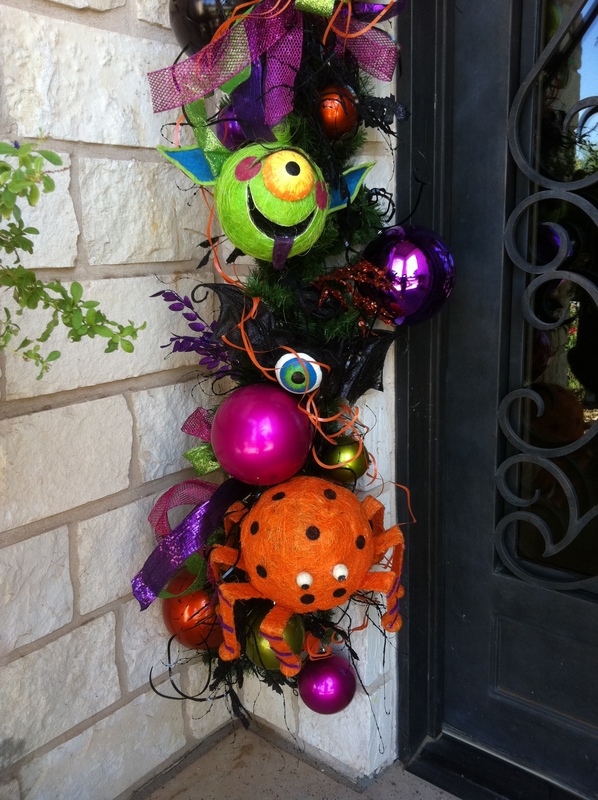 Show Me a Frightfully Fun Halloween Garland! 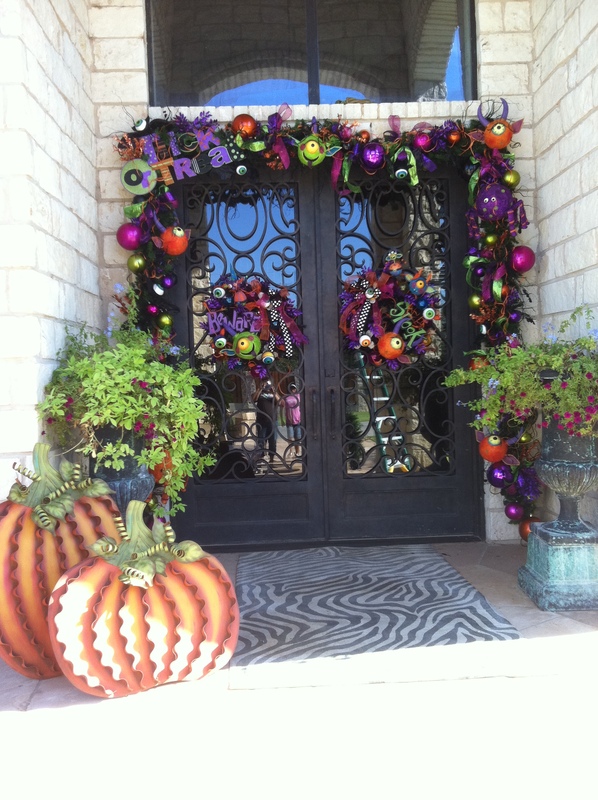 Wreaths that match are added to complete the doorway! 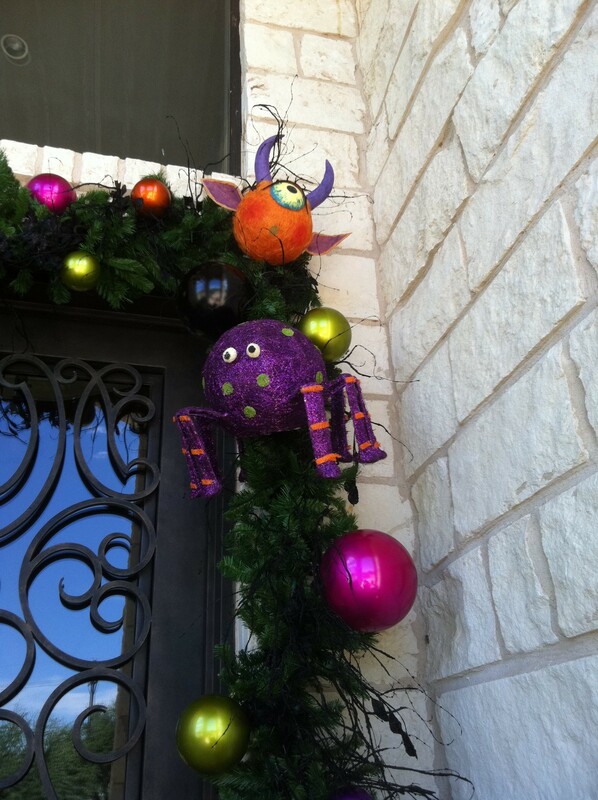 Need help decorating? Check out our app for iphones and ipads! 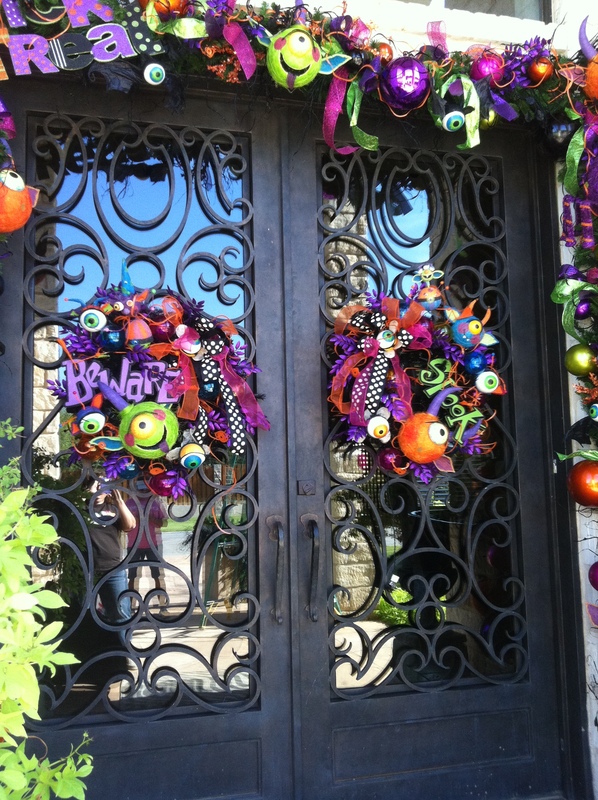 Special thanks to Our designer Georgeann for the Fun instructions, the Show Me Decorating Team, and Mindy for a fabulous doorway!